Yet another Minifooger that takes a standard effect and offers the user a whole range of new possibilities. The MF Flange is the only pedal in the Minifooger range we haven't tried, and so we come to it with the weight of expectation generated by its siblings. For those not familiar with the Minifoogers there are a few shared qualities to note. Firstly, they are built to withstand the abuses of live performance. Secondly, they are 100% analogue and provide a high-quality signal path, whatever the effect, as well as True Bypass. Lastly, they all have an expression pedal/CV input at the rear for extra control. We still have our '80s Carlsbro flanger that pretty much nails a standard version of the effect, but only recently have we started using variants of this often clichéd modulation effect again. When used subtly, with very slow modulation/sweep rates, flangers can add depth to instruments and vocals, without having to sound like The Cure. Plugging in and tinkering with the Minifooger, for what turned into hours, we quickly found that subtlety can be achieved by keeping the Depth and Rate knobs just off minimum and using the (delay) Time and Feedback controls to carve out the space. The fifth control, Type, is a switch that toggles between positive and negative feedback mixes, just like our Carlsbro. 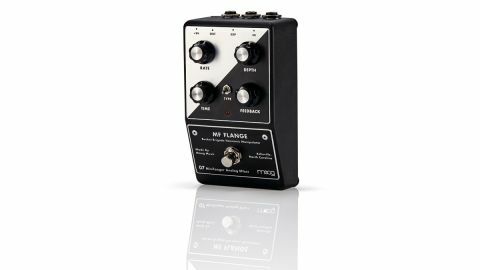 Being a Minifooger it leaves our old pedals in the dust with regard to range: the MF Flange can do what most flangers do in the first 20% and then spins off into space where the term flanger starts to lose relevance. The subtitle of Bucket Brigade Harmonic Manipulator does indeed seem more appropriate. It is hard to describe the sounds one can eke out of the MF Flange. On top of the flanging, it is capable of producing a tighter shimmering effect, like chorusing, and some notch modulations that come out as more phaser-like. The Rate runs from almost static to super-wobbly at the top of the dial. The exponentiated triangle wave of the LFO reveals its peakiness with Depth turned up, and in this region things get bendy, especially when Time is wound down. Though the effect doesn't feed back into self-oscillation, the LFO can be clearly heard without any real input as the Feedback knob passes the 12:00 point, and it is here there is no mistaking this is a flanger pedal. It seems the Rate, Depth and Feedback knobs set the parameters of the effect, but it is the Time control that forms the character, at the heart of which is the BBD (Bucket Brigade Delay). The effect is at its most subtle, and classic, with this control wound right up, but by the bottom of the dial the effect gets into a strong metallic, comb-filtered space. Using CV or an expression pedal to sweep this control is where the MF Flange truly departs from its traditional roots; it can be given a phrasing, much like a wah-wah, that you don't get by letting the LFO do all the work. The Type switch is the final piece of the puzzle, with the lower negative feedback position billed by Moog as the more 'vocal' of the two, with the upper positive position being more traditional. It is the Time control that really dictates how the feedback characteristic interacts with your instrument; finding sweet spots where parts of a chord or melody pop out, while others become smeared and bent, can be truly absorbing. There is plenty of pleasure in exploring the outer edges of this effect, and with different sources come whole new sets of interactions. If you love flangers then it's a no-brainer: get an MF Flange now. If you love rich modulation effects then put this on the 'to-try' list, along with the MF Chorus. The Minifoogers are well priced to sit just above the standard Boss and MXRs, but often below the more esoteric boutique offerings, which are all too often hit-and-miss. Considering the design quality, as well as the manufacturer's track record, we feel these are always worth the expenditure.